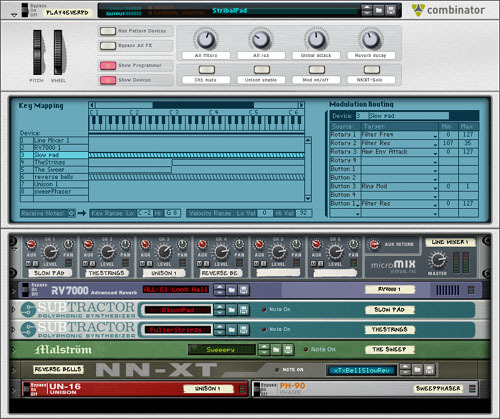 Combinator will let you build combination patches of multiple Reason instruments, as I and others had predicted. MClass mastering suite includes EQ, stereo imaging, compressor, and maximizer. new soundbank with Combinator patches and "more sampled instruments"
6:2 Line Mixer / submixer. onstage, even if it isn't a radical departure from previous versions. So why is this upgrade stirring up debate? Many expected a revolutionary Reason release, and this is evolutionary. probably won't care now. No, you can't load VSTs in Reason, but Propellerhead is the company that invented ReWire. requirements for Mac or Windows.